Floppy, a friend from Greenpeace, told me that he was going to go to the Greek island of Lesbos with a young NGO called Sea Watch, and that he was going to spend two weeks in December driving a rescue boat and plucking people from the Mediterranean Sea. As I was pretty busy during the winter, I decided to wait for his report and, around new years, I contacted Sea Watch and signed up for two weeks of search and rescue in April. In the meantime, Sea Watch had joined forces with CADUS, and bought a second boat that the two groups share. We ended up with almost two crews sharing one operational boat. For me this meant that every other day I’d get up at 3:25 AM, have some breakfast, go out in the boat around 4 AM and search the local coast for any signs of stranded refugees. Once we were done on the coast, we drove out a bit towards the Turkish border and waited if any refugee boats passed by. In the two weeks, we found exactly zero refugee boats (in contrast to the crews before us). The closed borders on the Balkan Route and the threat of being deported back to Turkey have slashed the number of people escaping into safety on this route. Our boat in the foreground, and the EURO in the background. The EURO brought some 200–300 refugees to Lesbos. 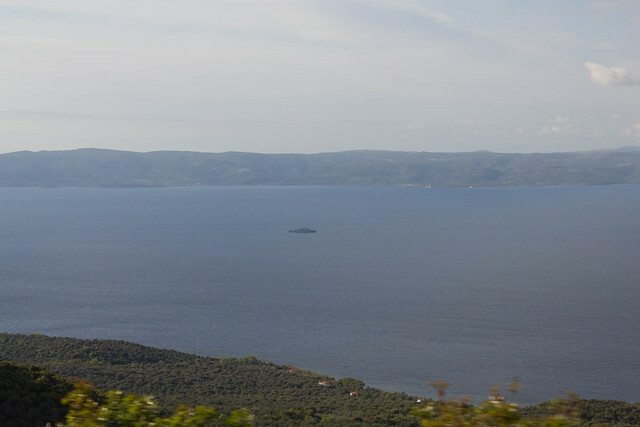 Lesbos Island and some key locations. We were based in Tsonia. The strait in the north is about 10km across. Our morning route went from Tsonia along the coast to Palios, then north to the Turkish border, west to Korakas and back home. Pro Activa Open Arms and the Boat Refugee Foundation operated from Skala Sikaminea, and MSF/Greenpeace from Molyvos. Moria is the main prison camp on Lesbos and Mytilini the local city and airport. 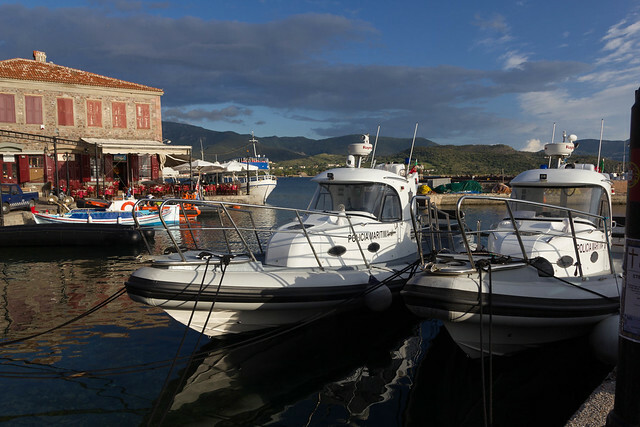 The Minden, a 23m SAR boat of the DGzRS is based in Mytilini. They work for the Greek coast guard. The larger area. Now that the Balkan route through Macedonia is blocked at Idomeni a massive camp with some 50 000 refugees has formed there under desperate conditions. The other popular route to Europe is from Libya to Lampedusa. Obviously a lot further than Turkey — Lesbos, it has had a ten times higher death rate than the route via the Greek Islands this year. As Libya itself is very dangerous people started embarking in Egypt and heading to Lampedusa. A ship with 400-500 people sank on that route two days after I arrived back in Hamburg. When it comes to actual rescue operations, the legal situation can be a problem. As a basic rule, it is illegal to help refugees get across the border. 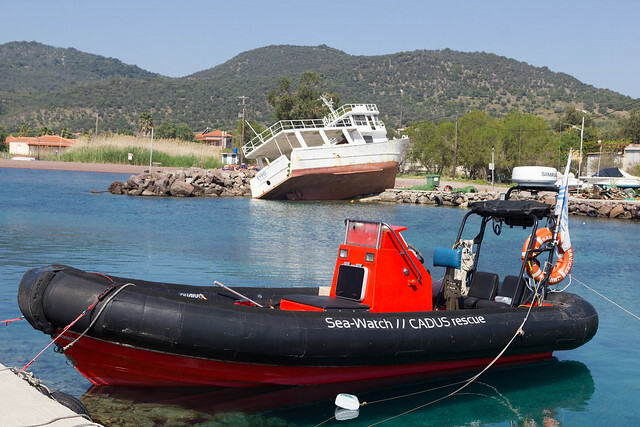 This means that towing a boat with a broken down engine from Turkish waters into Greek waters can be considered as trafficking by the authorities. Trafficking charges are no fun and can get you jailed for years. One group of volunteers faces exactly this problem as they got jailed in Greece for trafficking charges (they are out on thousands of Euros of bails and the trial is pending). Generally, the Turkish authorities do not allow the volunteer groups to perform SAR operations in their waters. I was told of one case where the volunteers were forbidden to assist a refugee boat in emergency, and people drowned because the Turkish vessels did not make it in time. In another case, the volunteers could not help a boat with an engine failure just on the Turkish side of the border. In that case, the Frontex (EU border police) vessel picking the refugees up was so friendly as to bring them to Lesbos. I guess, they did not have to face trafficking charges. Once on the island, there seem to be very particular rules, as to where giving refugees a ride is legal or considered trafficking. Kind of similar to trafficking accusations for people giving refugees a ride inside Europe, while there were overcrowded official special trains providing the same service on the tracks right next to the highway. Currently, the waters between Lesbos and Turkey are patrolled by the Greek coast guard, and their European Frontex colleagues, NATO warships, Turkish coast guard and warships, several official SAR vessels assisting the Greek coast guard, and a whole bunch of volunteer SAR groups. Collaboration inside each of the sub-groups seems to be good. From what I’ve heard, the NATO warships (apart from being huge lookout posts) seem to play a bit of a referee role for Greek and Turkish coast guards (the two countries don’t get along at all). The collaboration between the official SAR and the Greek coast guard seems to vary depending on the situation and who’s in charge, but seems generally good. Volunteers and Frontex — well, seems to depend on the specific teams involved. NATO? warship in the war on refugees. Portuguese Frontex vessels in Molyvos (they were rather friendly). In the left, you can see a black rubber boat used by refugees, a local fishing boat and two boats used by MSF. One week after I arrived to Lesbos, Greece deported the first ~200 refugees from the prison camp of Moria to Turkey. These people had not (had the chance to?) applied for asylum. The deportation was announced to the media for 10 AM and actually performed about an hour earlier to avoid protests. Our crew was in the harbor with a banner that they put up in cooperation with Platanos, another NGO doing SAR. The team of Pro Activa Open Arms took the photo, while the Greek Coast Guard decided to photo-bomb in the best manner possible (and tell them off). What happens to the refugees in Turkey remains largely in the unknown. They get put into prison camps, that even the UNHCR is not allowed to visit. Merkel just visited one for the press, but one can safely assume that to be a Potemkin Village. Conditions in those prisons most likely are worse than in the EU prison camps on Lesvos where there already is a massive lack of food, clean water, medical aid, and sanitary installations. Many (most?) of the refugees get deported back to where they fled from. The total number of people deported to Turkey still is in the hundreds, with thousands of asylum applications currently running in the Moria prison camp, and it remains to be seen how things will continue. After the deportations, we kept patrolling the coasts and shuttling TV and photo teams around. I spent three of my (probably) six morning patrols with press on board. So far, the result is this video on Spiegel Online [seems like wordpress in unable to embed it]. We used some of the afternoons to practice rescue operations with the team of Pro Activa. They are professional life guards and it was awesome practicing with them. For the practice we used an old inflatable refugee boat that they had scavenged. This way, we could practice approaching refugee boats with two SAR teams, dealing with medical emergencies and evacuating people from refugee boats. A couple days after the deportations, we paid a second visit to Mytilini. On arrival, a coast guard vessel told us to stay put outside the harbor for some five minutes, because a ferry was deporting refugees and they didn’t want us to interfere. That had already been done by others. A group of swimmers had put themselves into the way of a ferry and had been arrested. We stayed outside the harbor and observed the Nazli Jale on its way towards Turkey. This time, the purpose of our visit was technical assistance by the DGzRS (the German NGO doing the SAR at the coasts) vessel Minden, and their technicians helped us clog a leak in our engine cooling system. Thanks a lot for that! Feels much better to drive a boat that is not leaking coolant. My third visit to Mytilini was on the day I left the island. This visit coincided with the visit of the pope. More on that in the next post. After our crew, Sea Watch and CADUS have scaled down the operations with CADUS still operating the shared boat. Most other groups have taken a similar path, scaling down but staying prepared for more people arriving on this route should the deal between the EU and Turkey break at some point in the near future.